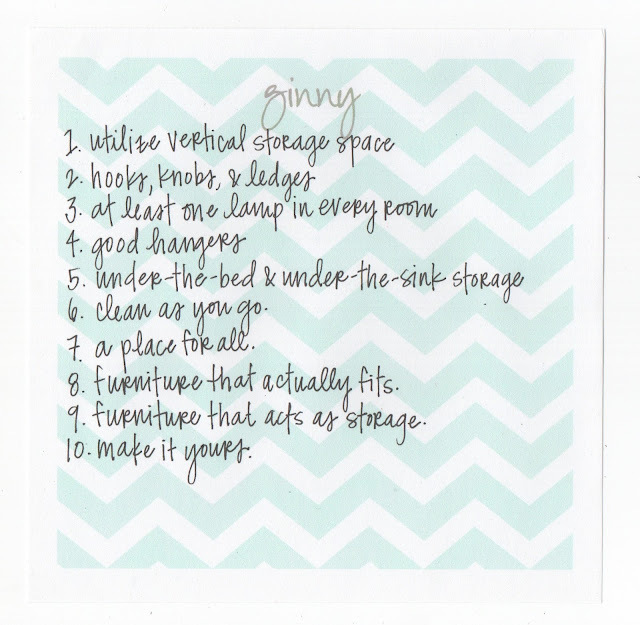 I thought I'd share some tips for living in a small space. (This is for you, Kate!) While I'm no expert on anything, I do have some experience with packing my entire life into a sardine can. Four years at boarding school, four years at college, and now nearly 5 years on an island have taught me a few survival skills. I'm someone that likes stuff. I like pictures, I like interesting doo-dads, I like a home that feels lived-in and cozy. Thus, living with only furniture and no decoration is just not an option. 1. Utilize vertical storage space. If you're limited with floor space, utilize the vertical. Tall shelves provide great storage and visually balance out a home where everything is at or below eye-level. Don't have enough room to store odds & ends on top of your dresser? Hang individual shelves. 2. Hooks, knobs, & ledges. Your closet may or may not fit your various coats, umbrellas, bags, belts, & hats. Stock up on a coat rack or over-the-door hooks. Have a designated place to hang your keys and keep incoming/outgoing mail. Otherwise, you'll walk in the door, throw everything on the one surface you have, and never find anything ever again. 3. At least one lamp in every room. Your natural light may be limited if you're in a small place. And the overhead lights will make you feel like you're in an asylum. Nothing cozies up a home more than lamps. 4. Hangers. Investing in good space-saving hangers is the way to go. I use the black velvet ones that snap together. 5. Under-the-bed & under-the-sink storage. You're probably going to have to use under-the-bed storage. (Trust me, I long for the day when I don't have to!) Make sure it's actually a system that works. Don't put anything under there that you wear on an everyday basis. Think bulky sweaters and swimsuits. For under your kitchen sink, buy something like this. It expands and you can leave room for the drain pipe and still have two shelves to store cleaning supplies, etc. I don't know what I did before I had one! 6. Clean as you go. Instead of letting things get as messy as possible during the week, try and clean as you go. Put the shirt back in the closet before you leave in the morning. Make it a habit to have clean dishes and an empty sink before you go to bed. 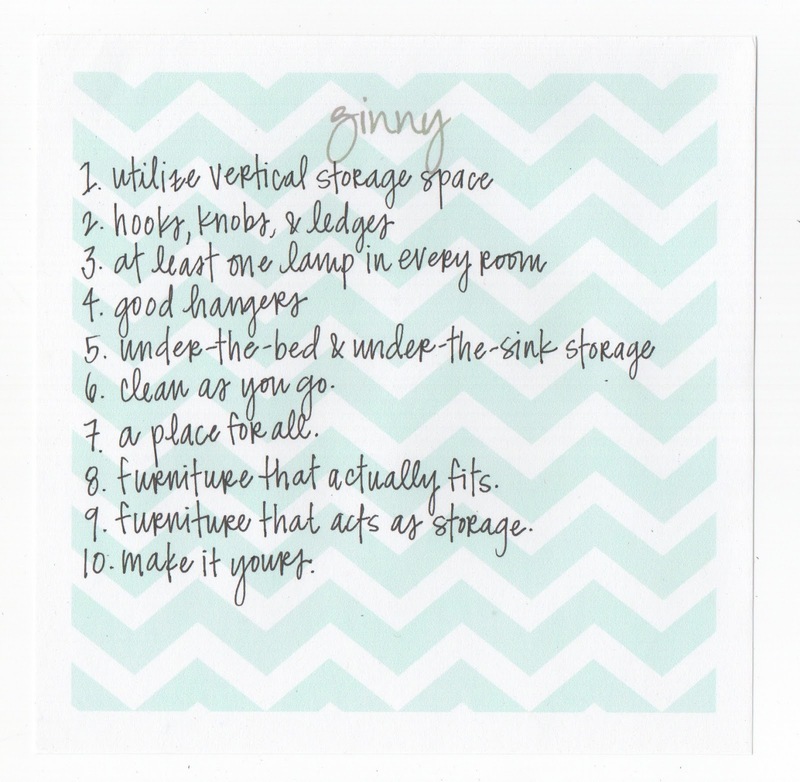 These little rituals will prevent the clutter from taking over your tiny place. 7. A place for all. Designate a place for everything from spare batteries to matches to your remote. If things are constantly changing homes, it's never going to feel clean and you're always going to be on the hunt for something. 8. Furniture that actually fits. Think about the space in your apartment and what would actually function the best. It can take a while, but hold out for the pieces that really fit and work in the space. For example, my kitchen is very narrow. I bought a long thin steel bar, normally used in restaurant kitchens, that provides the best functionality. 9. Furniture that acts as storage. Do you need a good coffee table or ottoman? Opt for one that has storage space for throw blankets, books, etc. 10. Make it yours. Not only do you want people to walk in your home and instantly see that it reflects you as a person, you want to feel at home where you live. Don't be afraid to decorate a small space for fear that it will leave things looking too cluttered. Give yourself a home that comforts and inspires you. Although these pictures are a little outdated, you can see my apartment here and here.